Aka, triple swivel caster, a wheel assembly designed to improve upon the traditional offset caster. In this case, "throw" refers to the offset of the pivot point of the caster. With most casters, the fork must rotate up to 180° when the unit reverses direction. With a zero throw, the casters are always oriented in the direction of travel. The redesigned 600 pound capacity Triple Swivel Caster (aka Zero throw caster) is the solution to many staging difficulties. Designed to be silent and vibration free, it transforms set pieces into mobile parts that can be easily manipulated. The casters are used with winched scenery on curved tracks and for wagons that change directions. Great for set pieces that actors move or dance with. Patented upper swivel bearing turns friction-free with 8000# static loads. Swivel wheels are bolted for easy replacement. Full line of swivel wheels for all stage surfaces, including exclusively designed polyurethane wheels with unique tread design to prevent bunching, cutting and abrasion of ground cloths. 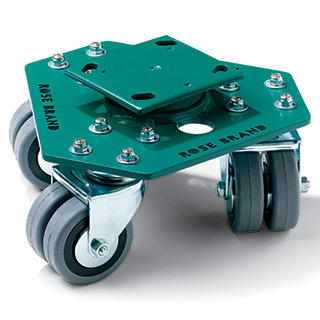 Also called Triway Swivel (Turtle) Caster by Mutual Hardware.